As we dive into round two of Battle for Vans Warped Tour, we are able to gain a closer look into the lives of the competing bands. Many of these bands come with incredible stories and journeys bringing them here to California, one of which I had the pleasure of interviewing, was Crimson Apple. When the band first added their two youngest sisters, they developed a different style and sound of their own. 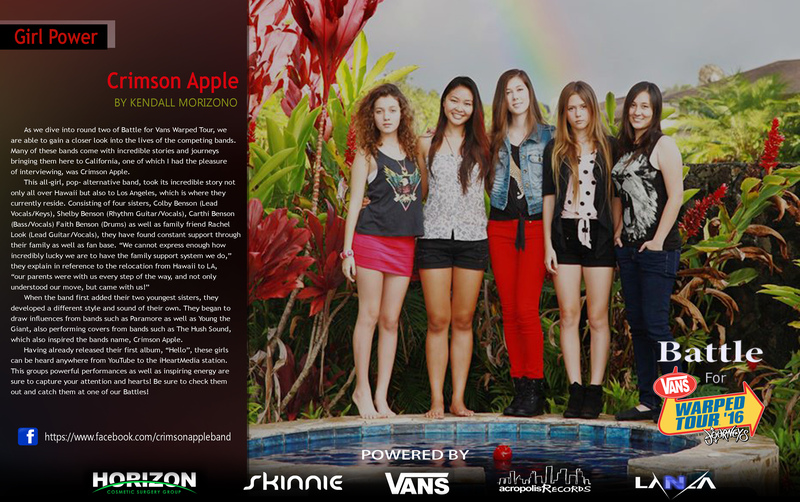 They began to draw influences from bands such as Paramore as well as Young the Giant, also performing covers from bands such as The Hush Sound, which also inspired the bands name, Crimson Apple. Having already released their first album, “Hello”, these girls can be heard anywhere from YouTube to the iHeartMedia station. This groups powerful performances as well as inspiring energy are sure to capture your attention and hearts! Be sure to check them out and catch them at one of our Battles!